Amy & I have identified the books we will read together and discuss in 2013. The goal was to select two books, but we ended up choosing three. The marriage book we will read is Love & Respect by Dr. Emmerson Eggerichs. I don’t know much about the book, but Amy has friends who recommended it and she liked the parts she came across while browsing through it. Dr. Fuhrman is a board certified family physician, best-selling author, and nutritional researcher who specializes in preventing and reversing disease through nutritional and natural methods. He is the father (creator) of nutritarian eating. A key component of nutritarian eating is the Health Longevity Equation which he also created. The first nutrition book we chose to read is Eat To Live. This is the first book Dr. Fuhrman wrote and I wanted to start at the beginning to understand the foundational theory and evidence behind his approach to nutrition. The second nutrition book we chose is Super Immunity. This is Dr. Fuhrman’s most recent book and focuses on foods that offer the most nutritional benefit according to his Health Longevity Equation. The first book provides theory and evidence on why nutritarian eating is the most effective way to eat. The second book provides clear advice on the most healthy foods. We will read and discuss one chapter each week. On weeks we go on a date we will discuss the book over dinner at a restaurant or coffee shop. On weeks we stay home we will discuss the book on a Friday or Saturday night before we start a movie. We will both highlight parts of the books we consider important and want to share or discuss. This goal has become a yearly tradition and one that has proven to be very beneficial to our marriage. 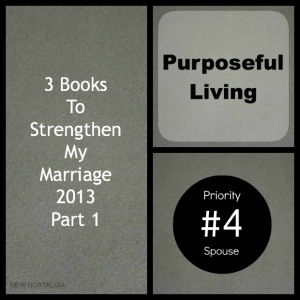 Reading a marriage book together is an opportunity to prioritize our marriage. It will allow us to focus on what is important to keep our marriage strong. Reading a second book of Amy’s choice is an opportunity to enter Amy’s world. It is an opportunity to learn what is important to her and show her I care about the details of her life. In future posts I will share the books we chose and some things I learned from each selection. Homemade & Healthy Lavender Lime Body Spray Spaghetti Sauce Sweetened With Carrots--Your Kids Will Never Know!